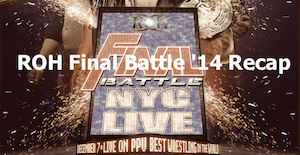 AngryMarks' own Rohan Unrau and Mike Poulin bring you their recap of the 2014 ROH Final Battle PPV! The main event featured Jay Briscoe vs. Adam Cole in a ROH World Title "Fight Without Honor." If you prefer to download our podcast directly to your mobile device, you can find this show on iTunes (kw: angrymarks). Enjoy!